Visit Commander Veldaban, who is at the Black Guard H.Q. in Keldagrim. The map above is for reference throughout the entire quest. Under White Wolf Mountain (requires Fishing Contest). 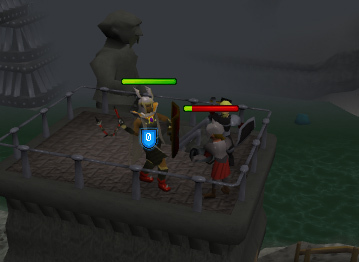 In a trapdoor by the Grand Exchange. 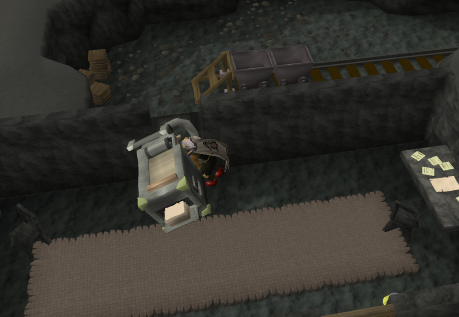 Using the mine cart by the Grand Exchange is the easiest way to go since it is easily accessible. 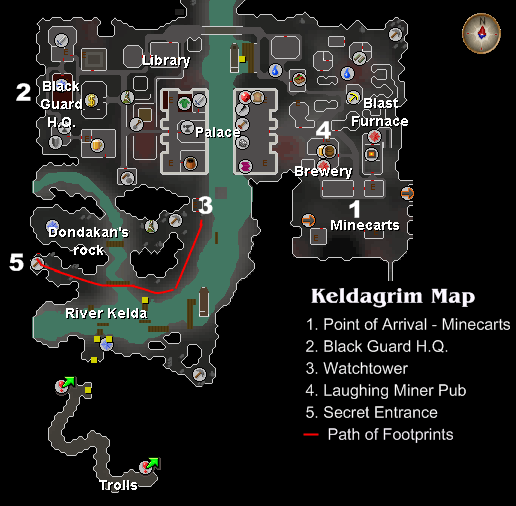 Once you are in Keldagrim you'll be in Keldagrim East. Head to the west side and enter the building just west of the bank, it'll stand out as its red floors are shown on the minimap; this is the Black Guard Headquarters. Once there, talk to Commander Veldaban. Ask him if he has a quest for you. He'll tell you that he is trying to conduct an investigation, but the Supreme Commander won't allow any guards to help him. Ask to help out and he'll start explaining everything. 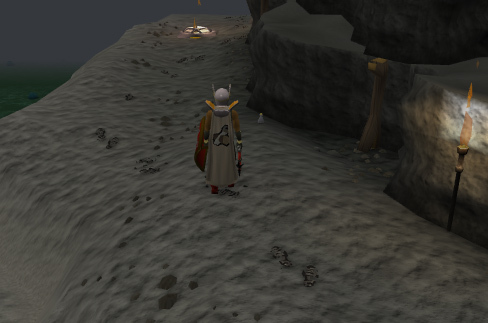 Apparently many people from Keldagrim East are missing, and he thinks someone is abducting them. From there, ask any of the options and you'll be interrupted. A Black Guard comes and tells the Commander of an attack by Chaos Dwarves. Without asking questions, the Commander welcomes you to the Black Guard. Colonel Grenda reports that there is only one Chaos Dwarf left in the watchtower. He says that he has some sort of new weapon. Feel free to ask any questions, and when you wish to continue, tell him you'll deal with the Chaos Dwarf. Right after that, Commander Veldaban decides to go too. The Colonel tries to get him out of it, but he demands to go and orders the Colonel to stay in case the Chaos Dwarf makes a break for it. You'll have the option to go and get ready or go now. 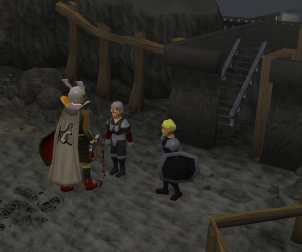 If you aren't prepared to battle a level 100 Chaos Dwarf, then go back to the bank and get some food and prayer potions if you're really worried. Once you're all set, tell him you're ready to go. Commander Veldaban will walk into the building to the north. Follow him and go up the stairs. There will be two wounded Black Guards. You can just ignore them and go up the second set of stairs to battle the Chaos Dwarf. It's pretty easy, but can hit high with range attacks. Putting on protect from missiles is recommended, but it will then attack with melee. It only has half life, and shouldn't take long to kill. Once you've killed it, it will drop a Mysterious Slip. Talk to Commander Veldaban and feel free to ask him some questions. When you want to continue tell him about the slip. He'll tell you to take it to the Grand Exchange and see what they know about it. Climb down the stairs and exit via the north door. You'll be on the west side of the city. Head to the east side and go to the mine carts. 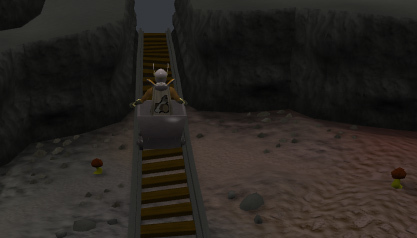 Just click ride on one of them and click on the Grand Exchange on the map shown. 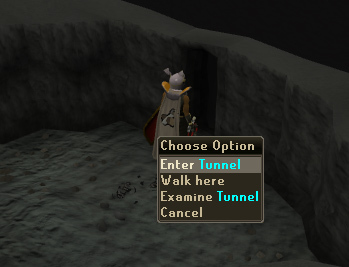 You'll appear right next to a trapdoor by the Grand Exchange. 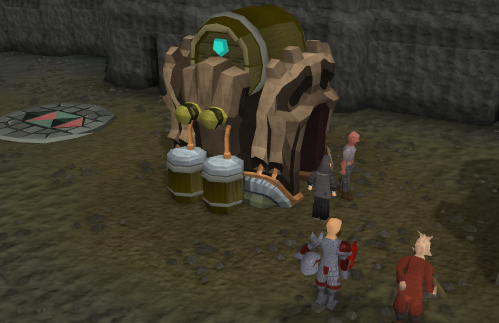 Head over to the Grand Exchange desk and talk to one of the clerks. Tell them about the slip. They will tell you that the order has been completed and will hand you a Package. Feel free to open the Package and look at the items inside, but you will not need them until later. Also, when you take an item out of the Package, you are able to put it back in. This will save some space in your inventory or bank. 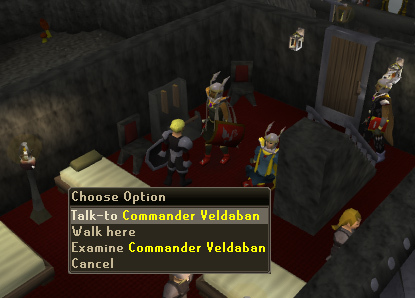 Go back to the trapdoor and you will have the option to go back to Keldagrim. Do so and upon arrival, head back to the Black Guard Headquarters. Talk to Lieutenant Brae and ask her where the Commander is. She'll tell you he went off duty and is in the Laughing Miner pub in Keldagrim East. Talk to him and ask him why he is at the pub. 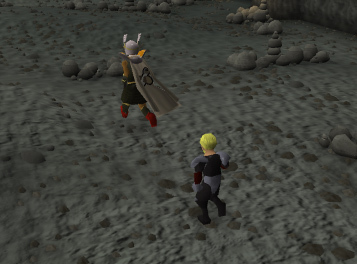 He'll tell you he was taken off the case for the missing people in Keldagrim East. Ask him why he was taken off the case. It seems the people of Keldagrim East aren't a priority because they are poor and unemployed. Begin asking him some other questions and eventually he'll just ask for another drink. Talk to the Barmaid and tell her the Commander wants a Guardsman's Stout. She'll ask if he's okay, just tell her he is fine and she'll give you the drink. Talk to Veldaban again and show him the Package. Ask him what he thinks of each item. He doesn't have much to say, so just ask to talk about something else and he'll ask if you can walk him back to Headquarters. Agree. Apparently Veldaban did get drunk and wants to speak with the Supreme Commander. Lieutenant Brae tries to stop him, but he walks past her. The Supreme Commander gets mad that he comes in his office drunk, but just suggests that he sleeps it off. Veldaban will then say that you care about the people and you'll sort things out. Then he leaves to go to bed. It's now your turn to investigate. Head to the tower where you fought the Chaos Dwarf. On the south side of it, there will be footprints. If you investigate them, it'll tell you that there are dozens of different types of footprints here and that if you knew what boot you wanted to follow, you could follow the footprints. Fortunately, you happen to have a Chaos Dwarf's Boot. Take it out of the Package and use it on the footprints. It will reveal the right route. Follow the footprints past a bridge until you reach a wall. Go back a bit and you'll see a firepit on the west side of the bridge. Take out the Metal Bowl from the Package and use it on the fire. It'll fit nicely over the fire. Now remove it and the fire will have gone out. At the bottom of the pit, there will be a square socket. Again, open the Package and this time take out the Rod. Use the Rod on the firepit and it will fit into the square socket. Turn the Rod once it is in the pit. This will reveal a tunnel in the wall where the footprints lead to. Enter the tunnel. You'll now be in an empty area. Go all the way across it to find a doorway, enter it. In here you'll find many mine cart tracks. You'll also find a cart and a control panel. Head over to the control panel and use either colored stone from your Package on it. You'll now be able to ride the cart if you have both hand free. When you ride it, it'll take you to a dead end. You must now go check if Veldaban is awake. 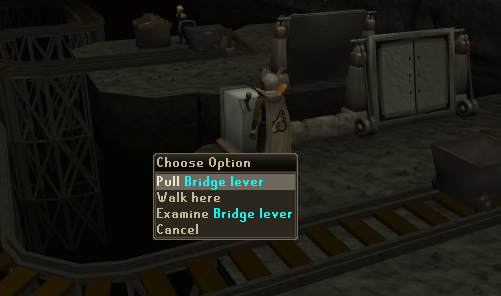 When you exit via the doorway you can choose between going through to the empty area or going to Keldagrim. 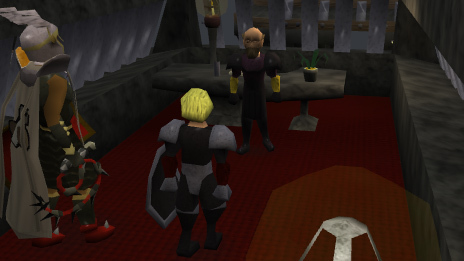 Choose Keldagrim and you'll appear right outside the Black Guard Headquarters. Go in and speak with Commander Veldaban. Tell him you found a secret doorway. He wants to see it, so you'll have to lead him to it. 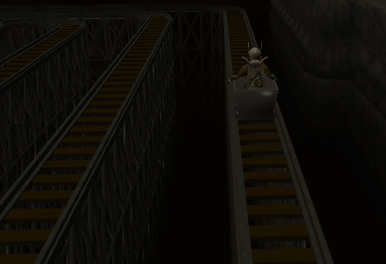 You'll now be on the other side of the bridge. Pull the bridge levers to lower the bridge and help get the Commander across. Head south and open the prison door. Talk to a prisoner and tell them to get back to Keldagrim. The Commander promises to help look for Hilda, a person the prisoner didn't mention. The prisoner wanted to know where Brunolt was. After that conversation all the prisoners will leave while you and the Commander are still at the prison. Ask him why he said Hilda. He tells you he didn't and he actually said Brunolt. He then starts having de ja vu again. Head even further south to a door and two switches. He starts to remember that he came to the door before with Hilda, apparently. He also remembers something important being beyond the door. Once you two have pulled the switch, enter the doorway. Brunolt is below you and the Commander, held captive by two Chaos Dwarves. 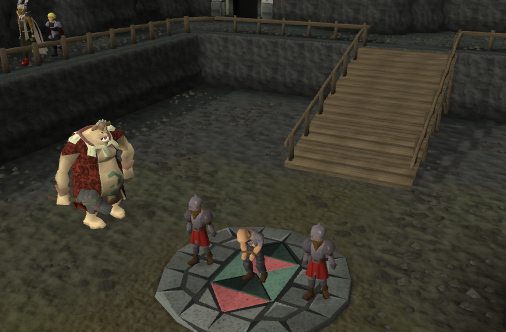 After some talking, the Ogre Shaman casts a spell on Brunolt into having him think he's a Chaos Dwarf and worships Zamorak and serves Red Axe. Then he is ordered to go through two machines to completely turn him into a Chaos Dwarf. Commander Veldaban cries out for Hilda and gives away the fact that you're there. The guards are ordered to go after you. Luckily, it's only one Chaos Dwarf hand cannoneer, level 100. Kill it if you want, or simply enter the office to get away from him. Talk to the Commander to understand why he shouted out like that. He'll tell you that Hilda was from Keldagrim East, so nobody would notice she was missing, so they turned her into a Chaos Dwarf when he and her were trapped in the office before. They let Veldaban go because they knew he would be noticed missing. Colonel Grimsson then comes out and states that Hilda was out gathering more people from Keldagrim East with a raiding party, and that she was a hand cannoneer, the one you killed. After some more talking about Hilda and how she was actually trying to help Veldaban even as a Chaos Dwarf, you'll have some options to say to Veldaban. Tell him there's something else in the Package. Take out the Metal Rectangle and Turnscrew. Use the rectangle on the machine to jam it. Then use the Turnscrew to unscrew it from the wall. Your character will then push it over, uncovering the hole in the wall. Enter the hole in the wall and Veldaban will follow. Then ride in the mine cart. This will take you into a cutscene where you and Veldaban try to warn the Consortium. Sadly, they don't take the warn too seriously and Veldaban decides to resign, however, he does thank you. Congratulations! Quest Complete! 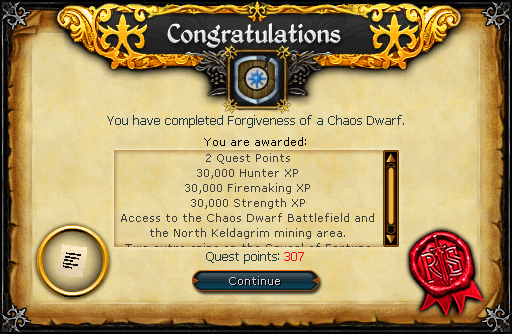 30,000 Firemaking experience 30,000 Hunter experience 30,000 Strength experience Access to the Chaos Dwarf Battlefield and the north Keldagrim mining area. [^] Take him back to H.Q.